This lovely scene was captured in the 1880s on the lawn of what is now the Glen Iris Inn. At the time the Glen Iris was the home of William Pryor Letchworth and the center of a thousand acre estate that would become Letchworth State Park. 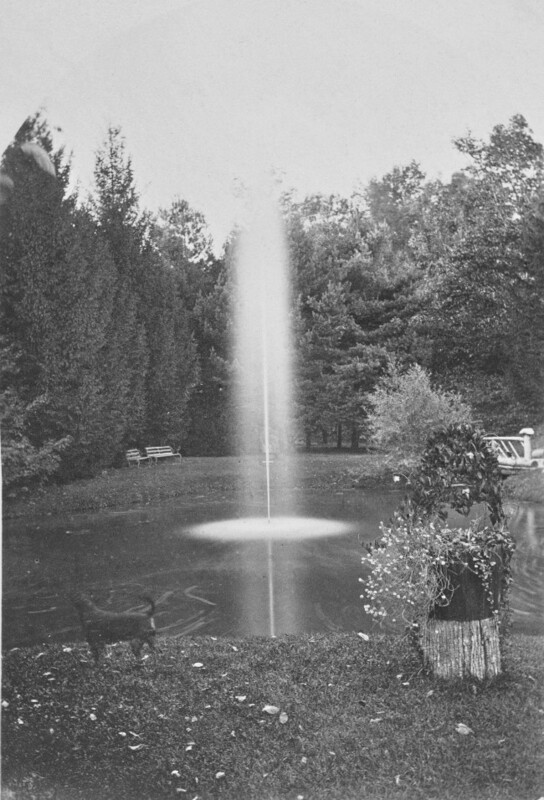 The pond and fountain date from the early 1860s. They were part of William Webster's landscaping plan. Webster was a landscape architect hired by Mr. Letchworth to design the new estate at Portage Falls. (see a description of the plan). The photograph was taken from a point on the eastern side of the pond, looking west or southwest. The Glen Iris would be to the photographer's left. If you look closely at the enlarged view of Image 149, you will see the same decorated stump (just to the left of the canoe in Image 149) that appears in the lower right of this photograph. The dog serves as a reminder that pets were welcome at the Glen Iris. You will find photographs of some of Mr. Letchworth's dogs and cats in the William Pryor Letchworth Museum. The identity of the dog in this image is unknown, since it does not appear to be Mr. Letchworth's beloved Cesar. The fountain, now almost a century and a half old, still flows on the lawn of the Glen Iris. The fountain is now using water from Trout Pond and the increased pressure allows the fountain to spurt much higher than it did when it was from the small natural pond above the museum. The constant plugging of the old pipe caused engineering to find a new water source for the fountain. Special thanks to Ted Bartlett for helping us with this image.